Yall need to stop entertaining @JeremiahC99. Clearly he doesn't understand the system as a whole and only cares about the routes and depot he uses. His opinion isn't gonna change the DOBs placement of these buses so just let him be mad. There's like 2 pages of arguing in this thread now because of his nonsense. Given the uproar from those in the 179 thread, I'm bringing the issue of Williamsburg Bridge capacity over here. I hope for this thread to also get good use in discussions about system capacity generally. There's a lot to say on both the historical and current fronts. The offending posts in the other thread begin here. I will be back in the not too distant future with a spreadsheet tabulating maximum historical throughputs on all tracks in the system, as well as current statistics. You know, I'm all for frank discussions on the nuances of deinterlining, but this is flat out wrong. Rogers Junction is *the* limiter of IRT express capacity; the fact it can only handle 45tph plays a massive role in the crowding issues seen daily on the . To deny that for the sake of some (valid, albeit parochial and reductive) desire to preserve a one seat ride despite the civic costs is...sad. Advocating for what's best for you underpins democracy, but to do so without leaving any room for nuance is at best to engage in disingenuous discourse. I want to return to Rogers' effects on the lines it serves though. The slaughter of area capacity is well established; allow me to add color to reliability claims. This is going to be stringline intensive; sorry for taking up so much space. This AM rush on the -- note the crazy runtime variability and strangely spaced service heading up Lex: This AM rush on the -- again peep the runtime var: Yesterday PM onto Nostrand, once again, it''s all about runtime variability and long dwells at Franklin. Yesterday PM rush -- note how those long dwells drive runtimes from Atlantic to Franklin up: ...but hey, it's not an issue. But this is a failure in scheduling, no? There's certainly much to be bemoaned and fixed in the way schedules are written these days -- flagging being accounted for by placing 5 minute holds in convenient places, merges being made to work via the same, OTP being maintained by scheduling asymmetrical runtimes approaching the terminal -- but schedules should be (really, have to be) more than 'guidelines.' The system falls apart if they're just that; merges are thrown off, capacity doesn't meet its expected value, trains fall ahead/behind creating gaps, TOs and CRs don't know if they're under or over performing, etc. 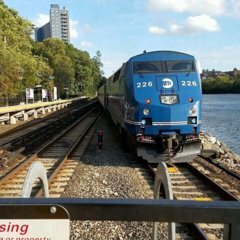 Running an unscheduled railroad with the complexity of New York's is a recipe for congestion and chaos on the operational end, and is a disservice to the commitment to a certain level of customer service that is a schedule on the rider's end. I'd argue that we can absolutely say that today's schedules are frequently garbage, but that we shouldn't say that they should be thought of in that way for the future. Honestly, what they should be doing to the entire system is what they did to the IRT last year: taking a close look at runtimes between every station pair for a given time of day, schedule, say, the 60th or 75th percentile runtime from that, and then adjust merges to fit. For the metrics to not get thrown off, they should then just simply report runtimes rather than OTP -- no risk of padding if the metric is absolute. Something else worth looking into is getting more granular schedules. 30 second resolution makes it hard to work with weird frequencies especially as they ascend, which in turn leads to situations where you're forced to schedule 90 second headways with the expectation that the resulting congestion will normalize it to 110 or 120. Needless to say, this is bad for service, and maybe is something worth looking into. Personally, I hate it. I think it looks visually... messy. One navy or yellow stripe could look nice, but both is too much. It looks tacky to me. Stainless steel looks sleeker to my eye. It's even worse on the inside. All the blue and bright yellow on the inside of the public R211 mock-up gave me a headache. I'd much prefer white and stainless; it looks far cleaner, brighter, and more relaxing. Also, stainless doesn't need to be repainted every few years. I suspect these stripes are going to look like garbage 10 years in. MTA will probably realize that paint is more trouble than its's worth and go back to stainless, like SEPTA did recently with its BSL (orange line subway) cars. Considering all the other crap that makes it onto the subway, this one's relatively tame. At least he's somewhat considerate. Free oxygen for when the train's emergency brakes go off. There are some misconceptions about the relationship between speed and capacity that I’d like to clear up. First of all, what happens between stations isn’t nearly as important as what happens immediately around stations. Think about it like this: you have 2 trains running 2 minutes apart on some track. Train one stops at a station and dwells for 45 seconds — now trains 1 and 2 are at most 1:15 apart. What determines how long it will be until train 2 gets in the station (and thus your headway) is how fast train 1 can exit the station, how fast train 2 can enter the station, and how long the signal system’s enforced separation between them is. In essence, the signal system around stations generally has the most impact on operational performance. (Of course, merge/terminal capacity play a big role too, but station limits are most relevant to this conversation) This isn’t of course to say that interstations are unimportant. When you’re dealing with a conga line or some other irregular operational situation, you want a signal system capable of moving things along well. But for normal operations, unless your interstation signals are incapable of handling 2 min train separations (which is extremely rare) you’re fine. This brings me to my next point: slow speeds don’t *necessarily* mean less capacity. Signal systems are designed to simply enforce adequate train separation so that a train traveling at maximum area speed can stop. Thus if a signal system is designed around some enforced slow speed, train separation in the area will be less, which basically preserves your capacity. Where speed issues arise is if enforced slow speeds are retrofitted onto signal systems that were designed for higher speeds. Then you lose capacity. Bringing this back to the Williamsburg Bridge, the capacity issue isn’t so much the timers on the bridge — the signals are spaced per the timer limits — it’s the signal design at the ends of it. Trains are held too far back from the stations given the ridiculously slow speeds entering Marcy and Essex (10mph to both). Fixing that probably means resignalling or changing those stations’ configurations, but it’d definitely be worth it. @whz1995 The WillyB has been underutilized for years due to speed restrictions as we have mentioned, so seeing bikers win is little surprising at this point, and the side effect of years of operational inefficiency. *Additionally, this discussion on the train and WillyB should probably be moved to the random thoughts or proposals thread. This thread is for R179 developments when it gets back on topic. Somebody sell me on running the M14 to Chelsea Piers, because I don't see the point.... As far as this current discussion on here goes, running the M12 southward won't help that route & I'm not getting why there are as many people that suggest this.... BPC by itself isn't a ridership gen' & those patrons I don't see patronizing (extended) M12's any more, or near as much as they do the M20 (which isn't exactly saying much... lol)..... At minimum, the thing (M12) needs to be taken off 12th & put on 10th instead.... There shouldn't have been a first one.